Our pricing is designed to give you value, flexibility, and convenience. Whether you have simple seasonal allergies, complex food and environmental allergies, or anything in between, we have an option for you. With these new programs coming, this means our period of introductory services and pricing (seen below) will be ending very soon. 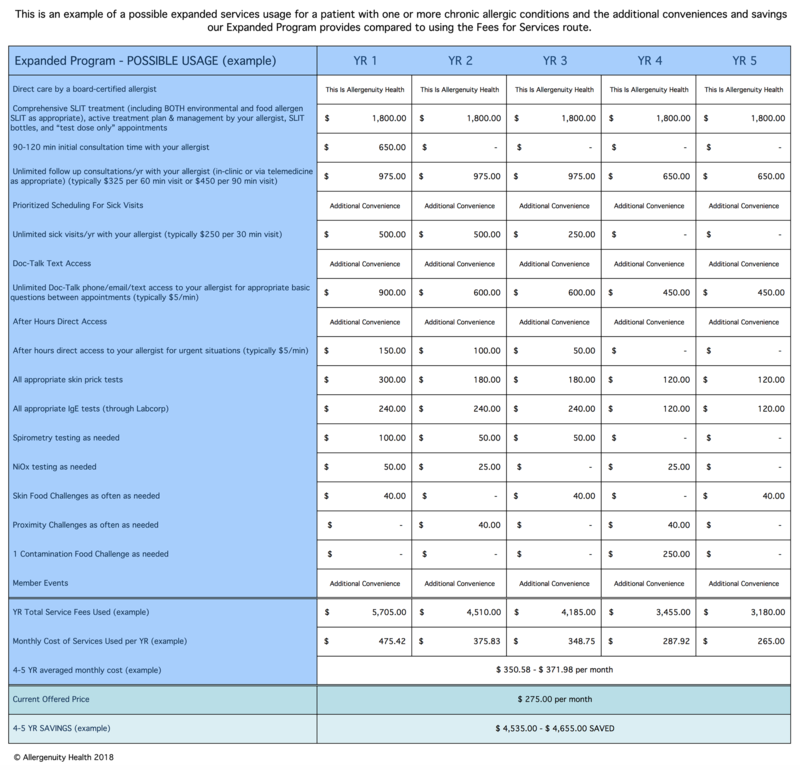 (Those already on one of our Programs will be grandfathered in on their current Program and pricing.) We plan to start each of these new programs with a free pre-consultation to help you find which program works best for your goals and allow us to get to know one another. Contact us to schedule your free 15-minute pre-consultation. 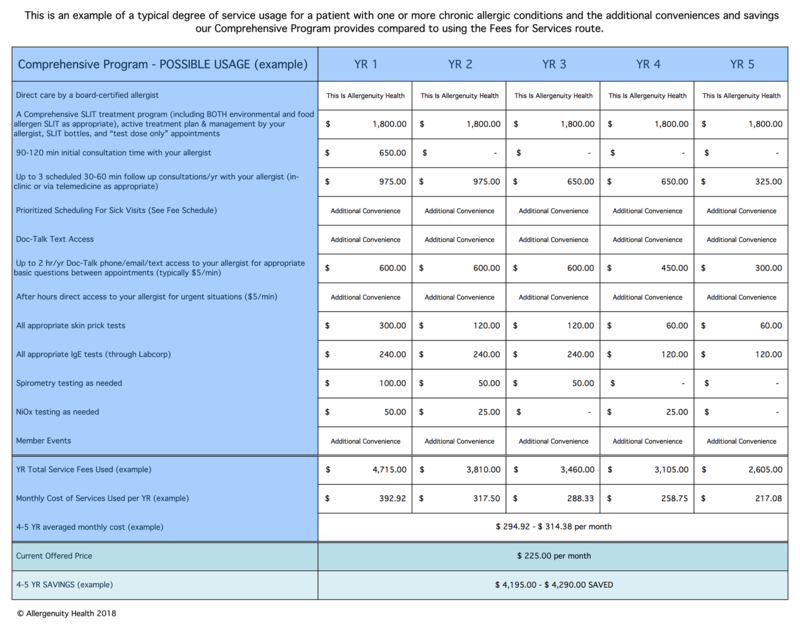 Our Programs are deferred payment options that we offer as a commitment between both us and you to work closely together for several years on attempting to train your immune system to handle your allergens much better. These Programs make your budgeting and our billing easier, allowing us all to focus more on your care. 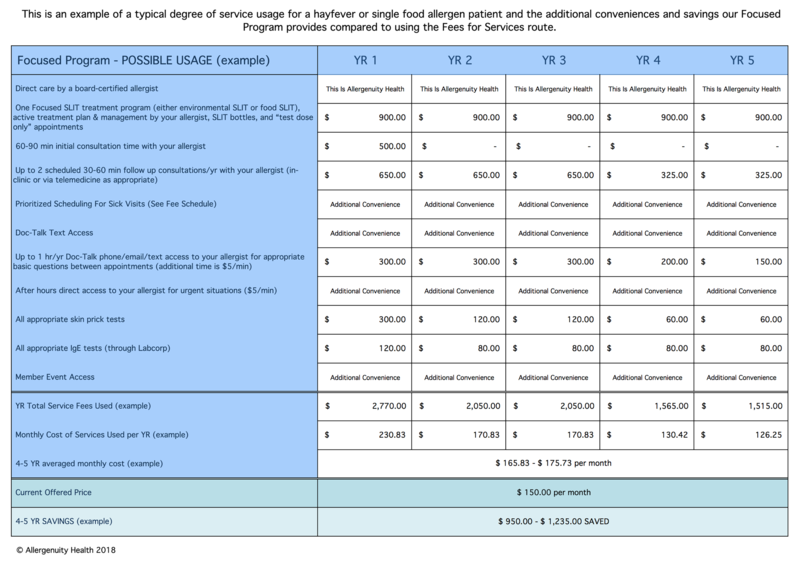 They defer your initial expenses out over time and account for the increasing costs of more allergen in your treatment over time as well, all while keeping your monthly expenses the same. They include all of the appointments, services, and conveniences listed here – AND – your complete SLIT treatment regimen including all of your treatment bottles. By committing to the process, we can provide you with additional great value and conveniences over the course of your treatment. Please see our FAQs page for more details on topics related to our Programs. So that Dr. Schroeder can set aside the time needed for our commitment to you, we will only be accepting and treating a maximum of 300-500 Program patients at any time. Used For: Straight-forward environmental allergies (hay-fever, watery eyes) or Single food allergen treatment. Access to highly discounted lab prices (via LabCorp) – Note: You may also go through your insurance (or self pay) for bloodwork at any lab of your choosing. Used for: Chronic conditions such as eczema, sinus issues, asthma, hives, GI disruption, multiple food and environmental allergies, etc. Used for: Those with chronic or multiple allergic conditions who desire additional access and more medical services. We believe in price transparency in health care, so the service fees for our common services are transparently listed for you below. This SLIT treatment pricing includes not only your SLIT antigen bottles as per your specific treatment plan, but also a monthly treatment email check-in, dose adjustments as needed, and “test dose only” appointments. Let’s get to know one another. We provide you with the opportunity for ample time directly with Dr. Schroeder to share your story, ask your questions, get answers, and gain confidence in how to manage your conditions. Initial Consultations take place at the Allergenuity Health clinic. These consultations can take place in-clinic, on the phone, or via telemedicine as appropriate. It is important that we stay directly connected to monitor your progress on your treatment plan, make adjustments as needed, and answer any new questions that may come have come up. These consultations can take place in-clinic, on the phone, or via telemedicine as appropriate. Life is unpredictable, so if something unforeseen happens and you need us, we will do our best to accommodate you as quickly as possible. We are happy to review previous records and fill out any necessary forms as they come up. Please provide us with important records or forms at least 1 week prior to your appointment (for records) or when they are due (for forms), and fill out forms as completely as possible prior to sending. These services are provided on site at Allergenuity Health. We have been able to develop a direct relationship with LabCorp and can offer you the rates below if you choose to do your Allergenuity Health bloodwork through one of their draw centers (with no insurance submission). Please note that the list below includes common tests, but many additional tests are also available at similar rates. Alternatively, your bloodwork can be done at any lab of your choosing, as long as the lab has the ability to run the needed tests, and you can use your insurance and its contracted rates.